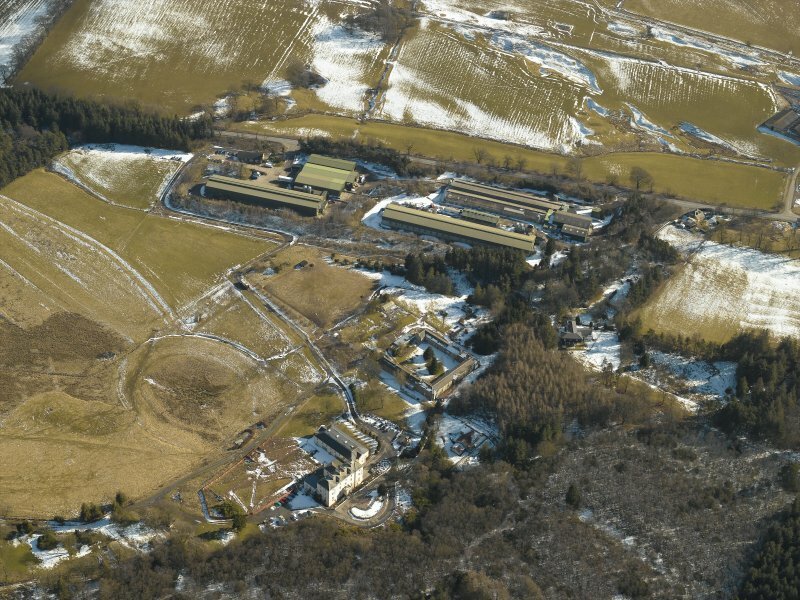 Oblique aerial view of the country house, the chicken sheds and the remains of the gardens, taken from the NE. 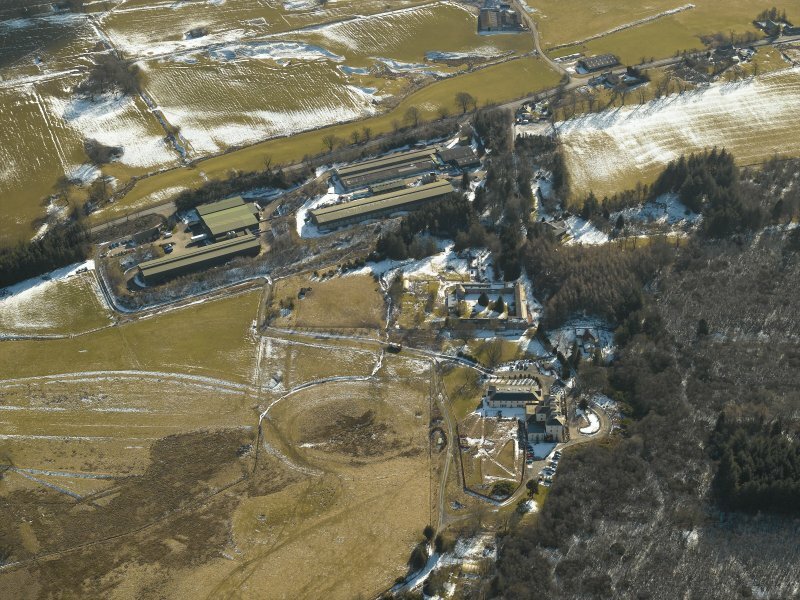 Oblique aerial view of the chicken sheds with the country house and the remains of the gardens adjacent, taken from the S.
General oblique aerial view of the country house, the chicken sheds and the remains of the gardens, taken from the . 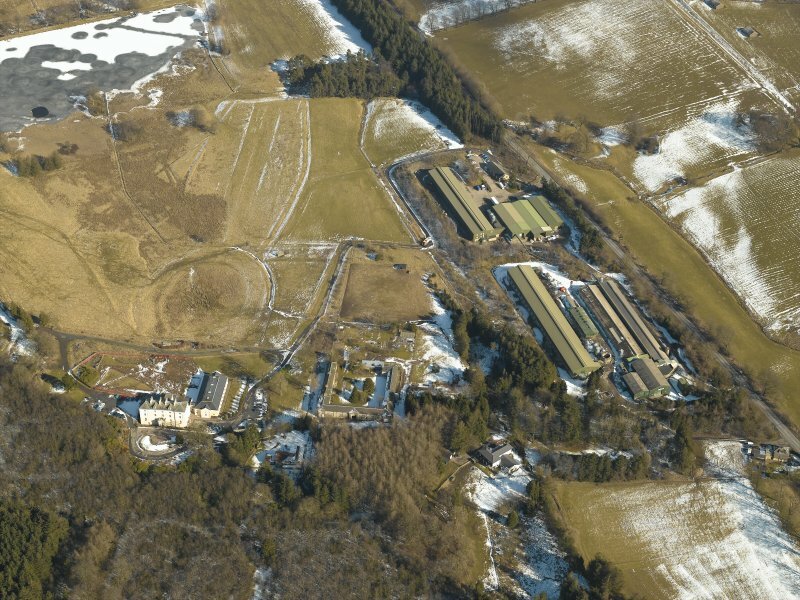 Oblique aerial view of the chicken sheds with the country house and the remains of the gardens adjacent, taken from the SSW. 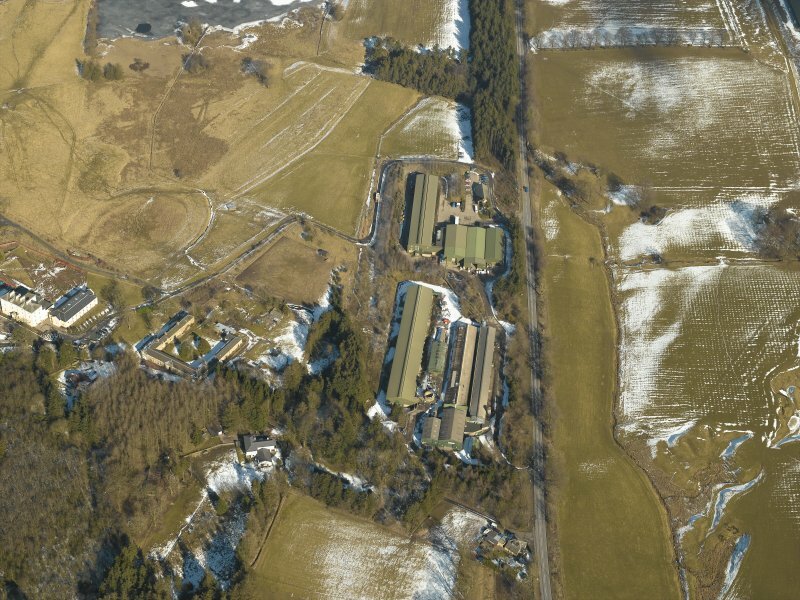 Oblique aerial view of the country house, the chicken sheds and the remains of the gardens, taken from the NNE. 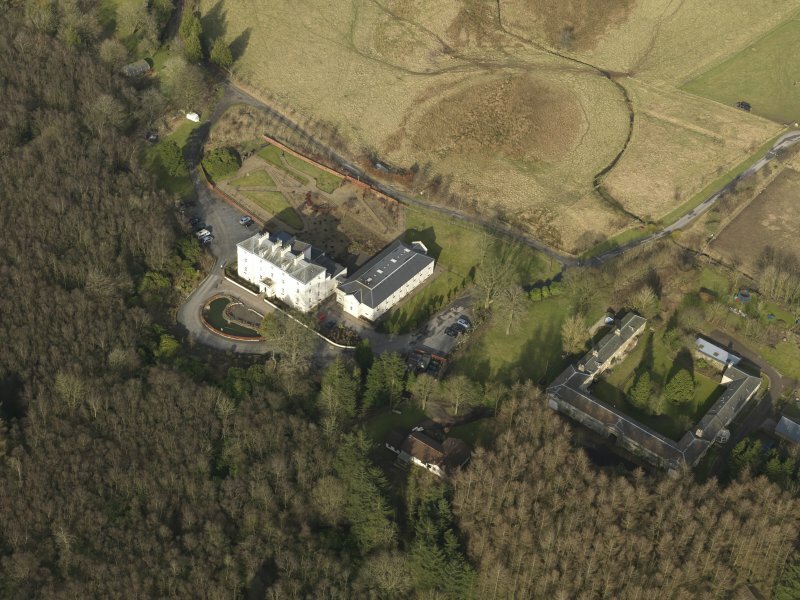 Oblique aerial view of the country house, the chicken sheds and the remains of the gardens, taken from the ENE. 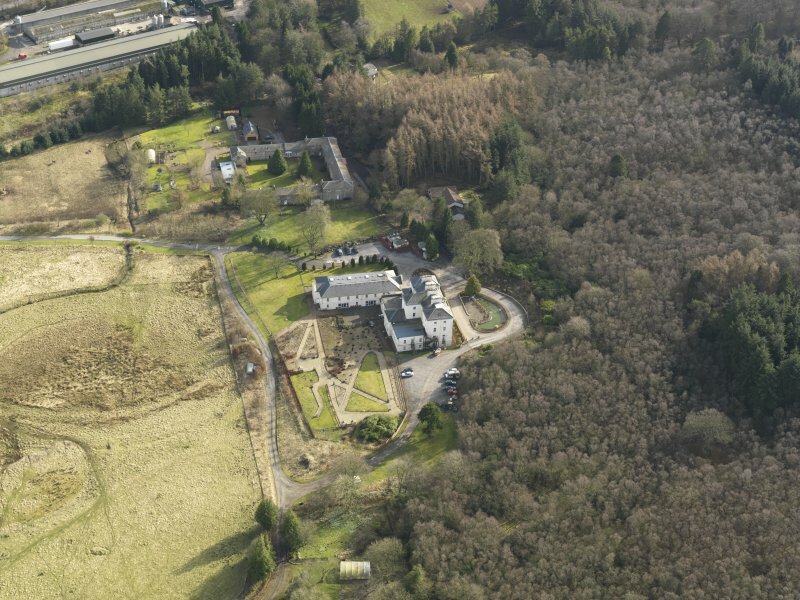 Oblique aerial view of the country house, the chicken sheds and the remains of the gardens, taken from the WSW. 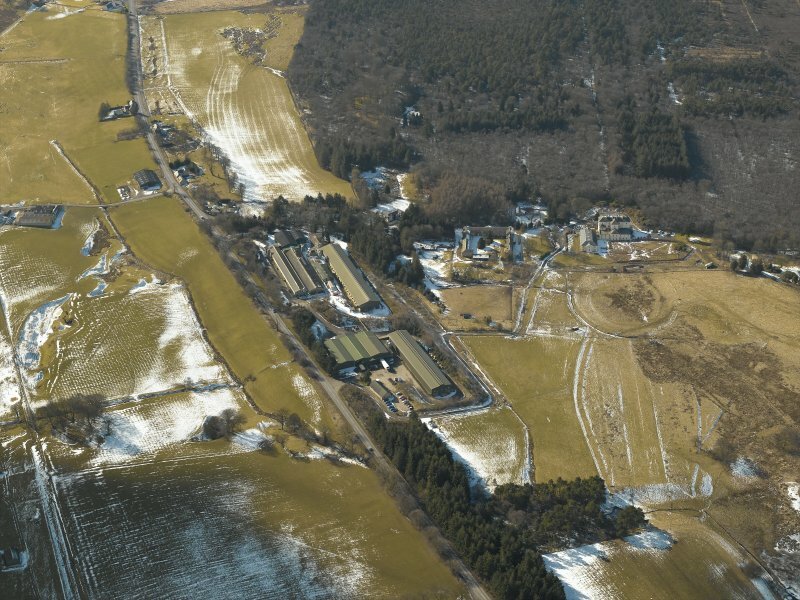 General oblique aerial view of the country house, the chicken sheds and the remains of the gardens, taken from the SE. 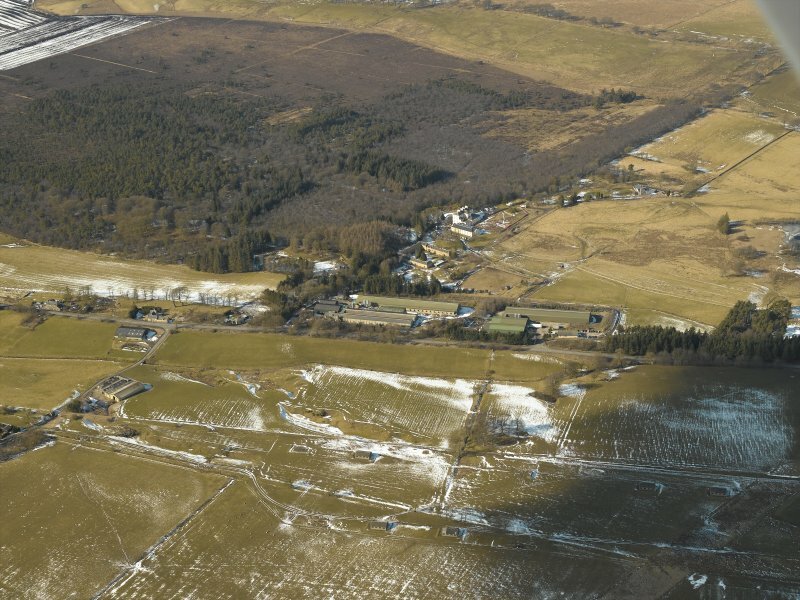 Whim House lies on the W side of the Edinburgh-Moffat public road (A701) about two miles SW of Leadburn. 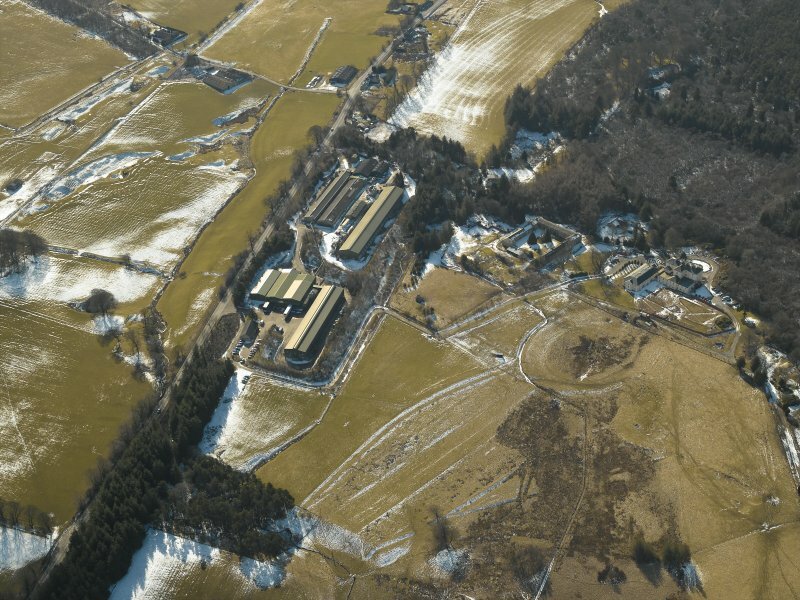 It was built between 1731-4 and extended several times. Whim House is now the White House Hotel and is as decribed in the hotel brochure. 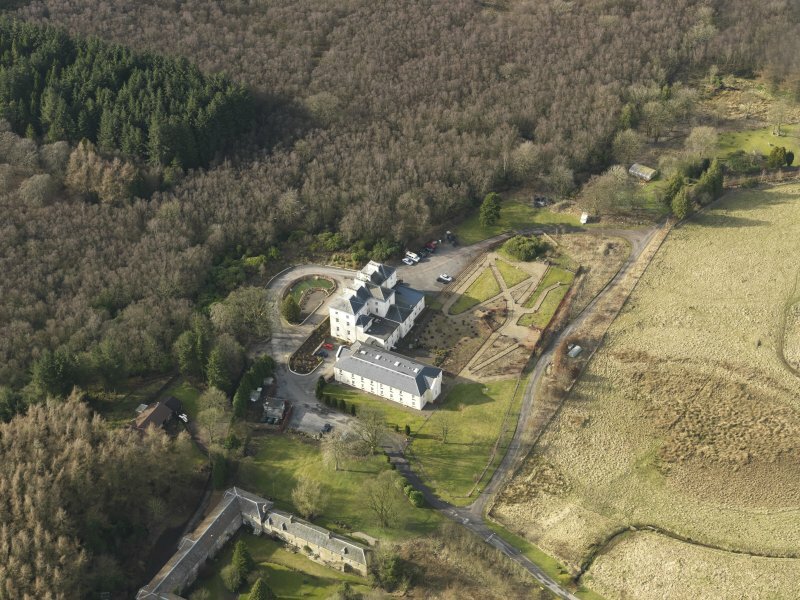 James Robertson new garden layout - late 18th c.
Owner: Dr J.D. Lockie, Whim Square, Lamancha, in 1990. Drawings WD 1- 7: Portfolio no 1: a bound portfolio of designs for additions to the house, in pasteboard covers decorated with marbleised paper in which red predominates. 13¼" x 19¾". The sheets are interleaved with pinky/mauve paper to preserve the drawings. Many additional loose drawings inserted at the end. Atrributed to David Henderson. Insc. (inside front cover): 'Ian C. Hannah Whim'. Drawings WD 8-17: Portfolio no 2: a bound portfolio of designs for additions to the house and offices and alternative designs for the facade of the stables. While obviously postdating Portfolio no 1 the status of these drawings is uncertain. 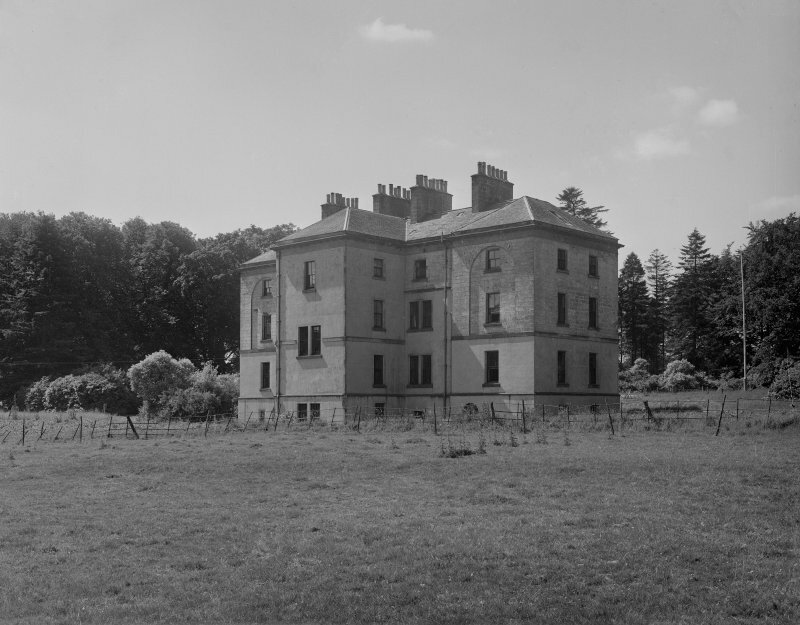 They may be either the presentation drawings of the executed designs or a record survey of the completed house. Bound with paper covers decorated with marbleised paper in which red predominates. (Front cover missing). 13½" x 20" (This portfolio has been placed inside Portfolio no 1). Drawings WD 18-25: loose drawings inserted at end of Portfolio no 1. Photographs of Portfolios 1 and 2: a collection of designs for additions to The Whim including designs for the stables and offices. Provenance: Presented to Dr Lockie by the Hannah family (late owners of The Whim and who may have retained a section of the drawing room from Portfolio 2. This collection of 25 drawings is unsigned but they can be confidently attributed to the architect, David Henderson (fl. 1765-c. 1787) through comparison with a portfolio of designs for Caprington Castle, Kilmarnock, Ayrshire (photographs in NMRS) dated 1780. The Whim drawings are less polished and they may therefore be earlier. The detail is similar to a tabernacle window and a lugged window surround also used by Henderson in his 1767 design for a house for Mr Hunter in New Street, Edinburgh (copies in NMRS). One of the drawings is inscribed verso 'Mr Henderson'. Henderson's patron was James Montgomery (1721-1803) who purchased The Whim in 1763. In 1775 he was created Lord Chief Baron of the Exchequer and the use of this title in the inscriptions suggests they must date from after that year. However, the inscriptions show signs of having had this title added later so it is possible that the design was in progress in 1775. 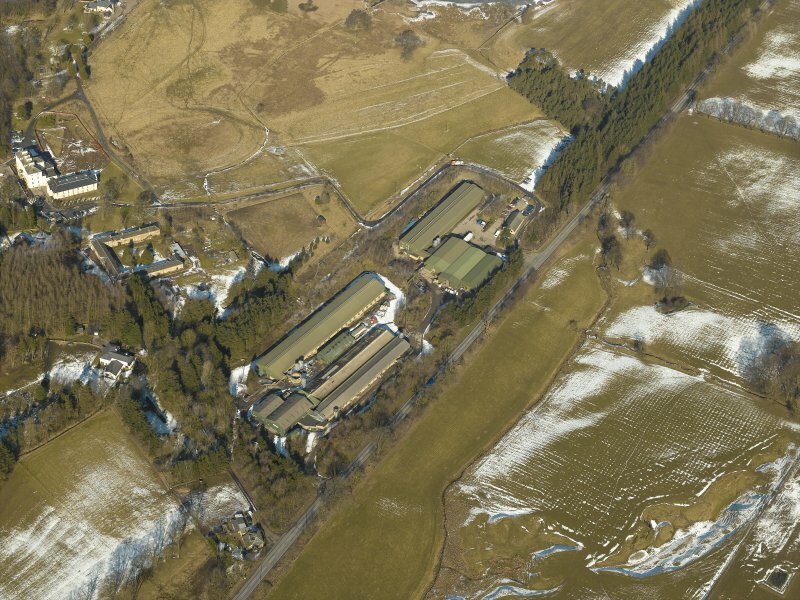 The designs betray the strong influence of Robert Adam's designs for General Register House. Henderson knew this particularly well because he was one of the contractors who built it. The imitation extends to the style of the drawing. 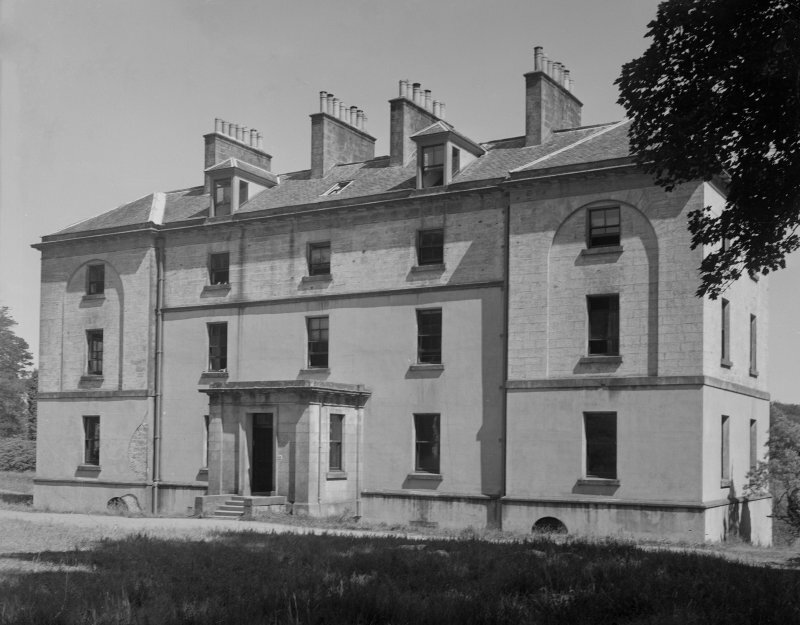 The designs offer further evidence of Henderson's fascination with geometrical shapes which are so marked a feature of the Caprington designs and also once featured at his Inverleith House, Edinburgh. Literature: W. Chambers, 'A History of Peeblesshire,' 1864. 17657-62 (?) Day Books of gardener at The Whim, 1755-61. 17642-51 Accounts and papers of gardeners at The Whim, 1729-63.